This article, by former tax counsel to the U.S. Senate Committee on Finance Dean Zerbe, asks what it would look like if donor-advised funds reform focused on, among other things, “getting…dollars out of warm banks and into the hands of working charities.” The result, concludes Zerbe, would be nothing short of astonishing. 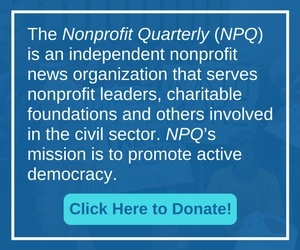 Today, NPQ starts a four-part series about proposals for regulating donor-advised funds, or DAFs, drawn from the summer 2018 edition of the Nonprofit Quarterly. The growth of these funds and the need for further levels of regulation is a tender subject that’s much debated. Through this series, we intend to examine that need and who ought to do what about it. This special report, by consulting editor Michael Wyland, is a first-of-its-kind analysis of the combined effects on the nonprofit sector of the relatively new IRS nonprofit automatic revocation process and the introduction of the 1023-EZ. Be sure to join us on Facebook this afternoon for a short but lively question-and-answer session with the author.